MALOU continues to travel south of Japan and has weakened into a tropical depression. At 2 pm, MALOU was centred about 220 km (120 NM) SSE of Tokyo. MALOU is the 105th name in the tropical cyclone name list. It was contributed by Macau, meaning agate. This name was used in 2004 and 2010. MALOU is expected to move NE or NNE along the northwestern periphery of the subtropical ridge in the next 24 hours. MALOU's core convections have thinned. The storm is expected to maintain intensity as it transforms into an extratropical cyclone in the next 24 hours. This is the final bulletin on MALOU. MALOU has intensified into a tropical storm. 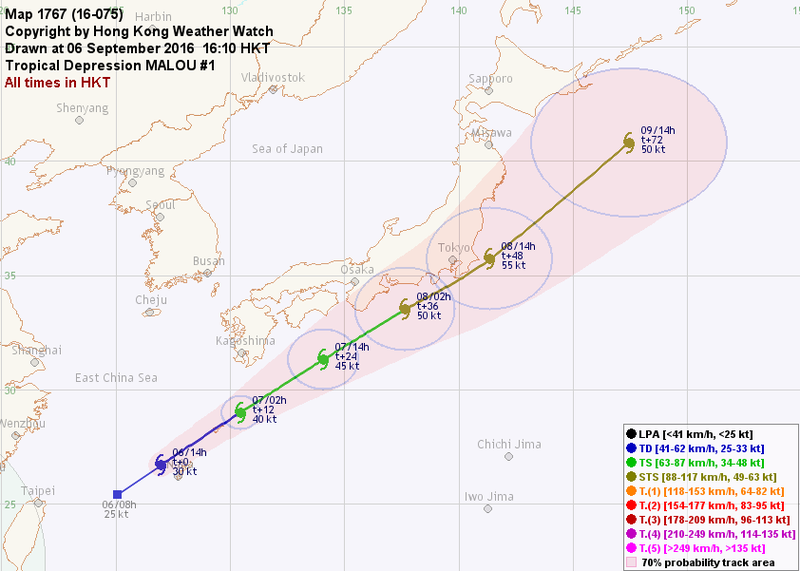 At 2 pm, MALOU was centred about 210 km (120 NM) SE of Kagoshima. MALOU will continue to move northeast along the northwestern periphery of the subtropical ridge, with a possible poleward deflection after t+24. MALOU's stronger convections are still confined to the eastern and southern semicircles. Shear conditions are marginal and this situation will likely continue in the next 24 hours. Extratropical transition is expected between t+24 and t+36. Tropical disturbance 96W east of Taiwan has intensified into a tropical depression. The JMA considers it a tropical storm and names it MALOU. 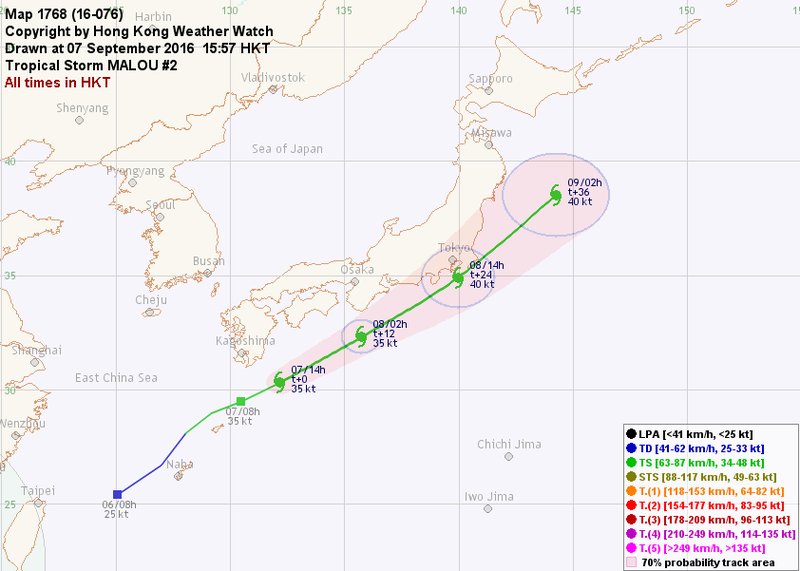 At 2 pm, MALOU was centred about 90 km (50 NM) WNW of Okinawa. MALOU is situated in the northwestern periphery of a subtropical ridge that covers much of the tropical northwestern Pacific. 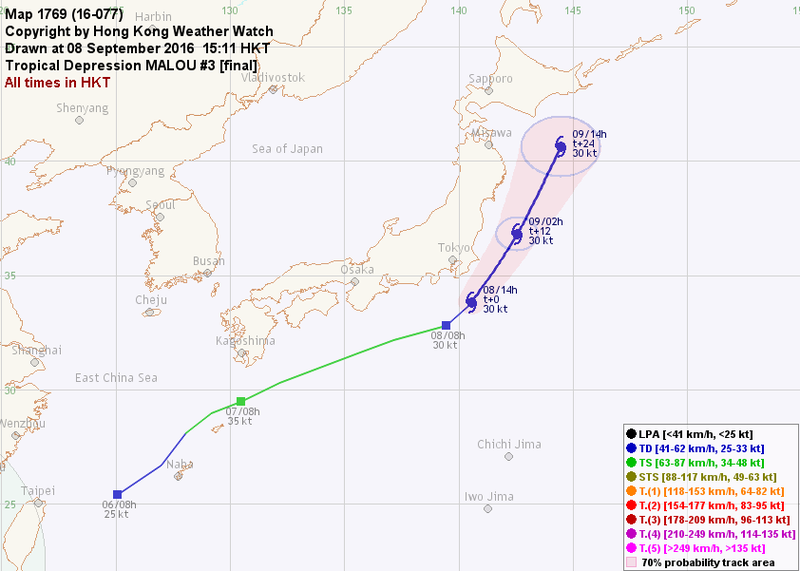 The storm is expected to move northeast steadily in the next 72 hours, nearing southern Japan on Thursday. Divergence is restricted in MALOU's northwestern quadrant; most of its convections are in its eastern and southern semicircles. The storm is expected to intensify in moderate atmospheric environment and warm seas, potentially reaching severe tropical storm strength as it nears the Kanto region. Extratropical transition is expected near t+72.